Deploy assessments at any scale, on any timeline, within your budget! Get started today! 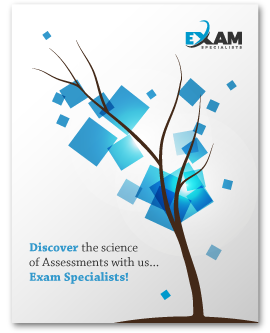 Exam Specialists brings a new dimension to the science of assessments by focusing on innovation, customization, security and customer satisfaction. We take a deep dive into the science of analytics surrounding the anticipated outcomes of assessments. By creating quick and easy ways to design, administer and analyze assessments our complex platform provides the data and results you want, the way you want it. Exam Specialists is an affiliate of the International Council of E-Commerce Consultants (EC-Council), a global leader in Cybersecurity headquartered in the historic city of Albuquerque, New Mexico. Discover the power of Exam Specialists firsthand by starting your free trial today! The most agile, cost effective online assessment platform in the market!